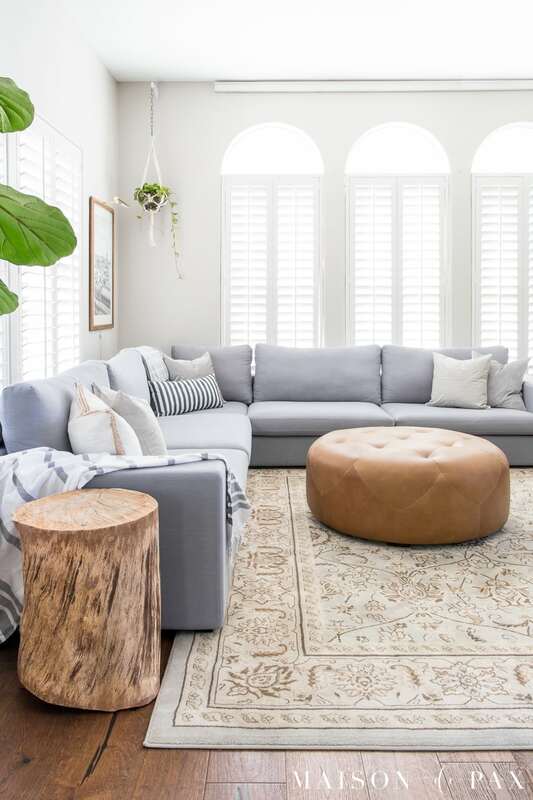 Wondering how to decorate a living room with a sectional? 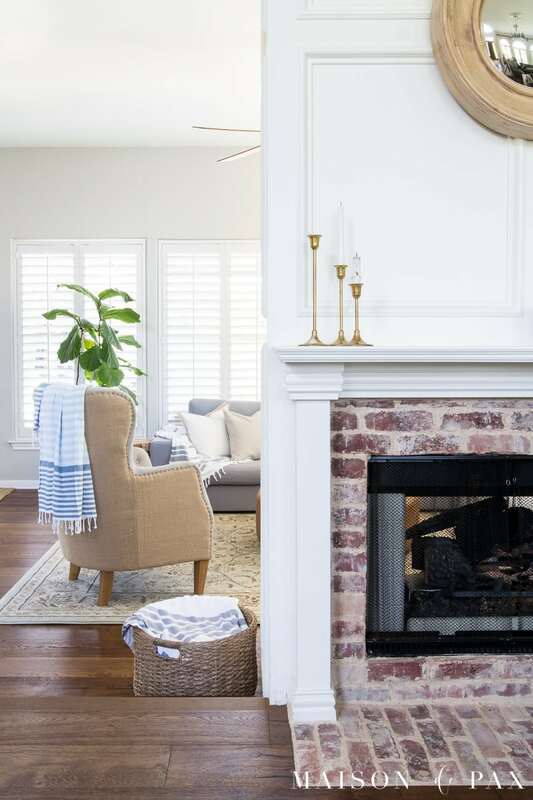 Get 5 tips for creating a bright, open feeling in your living space. 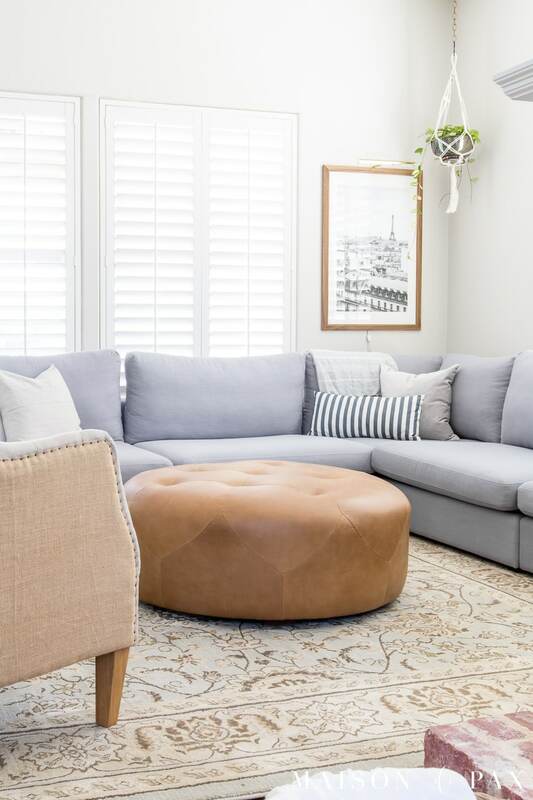 I recently shared our family room makeover for which Article generously provided a huge sectional and a gorgeous round leather ottoman. For all the details on the furniture choice and layout, you can visit that post here. Today I’m going to talk about the second goal I had in this space: a light, bright, open feeling (which can be tough with huge furniture! )… in short, how to decorate a living room with a sectional. 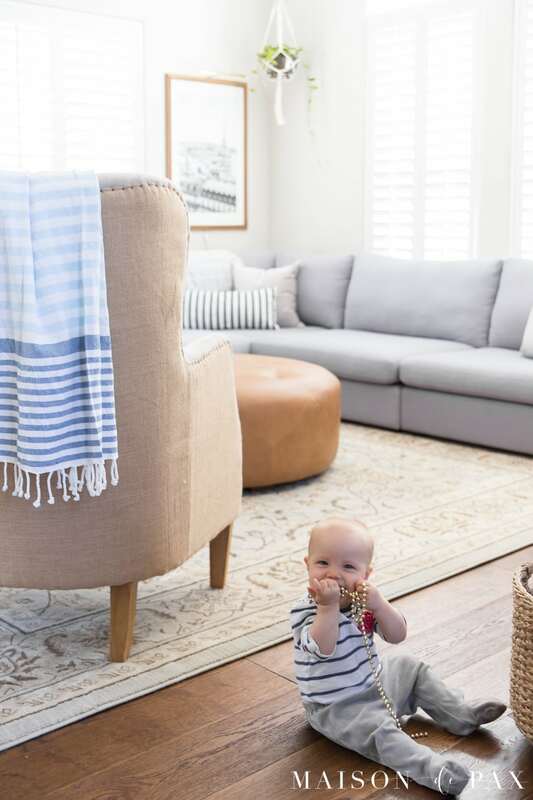 Even with young kids, you can find light colors that will enhance the brightness and open feel of a living space. Our walls stayed the same Sherwin Williams Agreeable Gray of our entire downstairs (you can see all our paint colors in this home here). 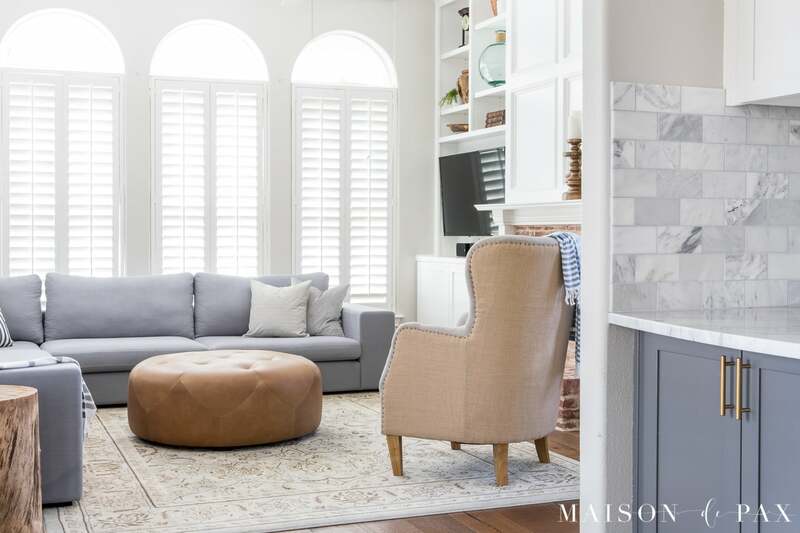 It’s a beautiful chameleon light gray color that looks warm or cool depending on the light – perfect for this space. All the trim is Sherwin Williams Extra White. A few lighter throws and inexpensive accent pillows and the lighter (yet still kid friendly) color scheme was complete. Real or faux greenery adds life and brightness to any living space. The fun project for this room was the hanging plant. 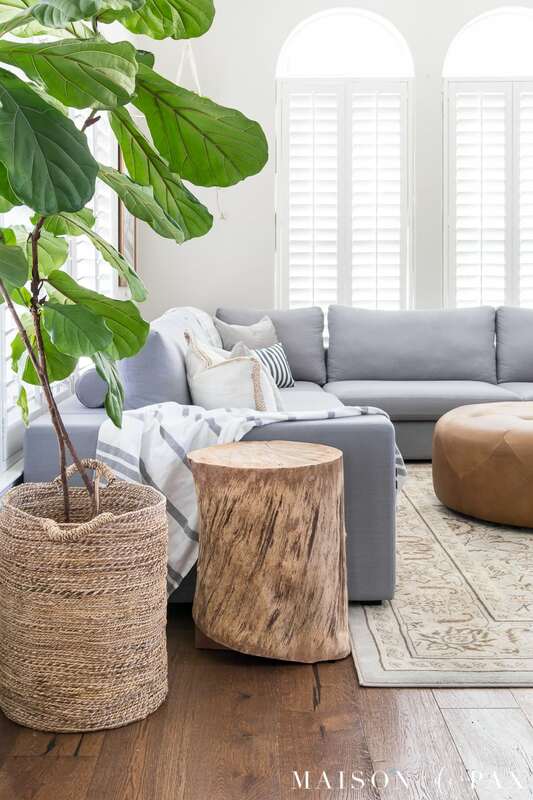 I am a big fan of balance over symmetry, and this seemed a perfect opportunity to put that into practice: balancing the fiddle leaf fig down on one end of the sectional with the hanging vine up on the other. This is a live plant, so I had to do some creative planning to make sure it wouldn’t drip on our new sofa. I originally had a little concrete hanging planter, but I may have accidentally left it sitting on the counter with the trailing vine hanging enticingly down to the ground… and the baby may or may not have pulled it off the counter onto the floor where it broke (and yes, she was fine, thankfully!). In the end, I decided a vintage silver bowl (which was actually an award given to my grandmother decades ago – so fun when something has history, right?!) was my best option. I simply placed the potted plant – still in its pot from the nursery- directly into the silver bowl and hung it with this macrame hanger. 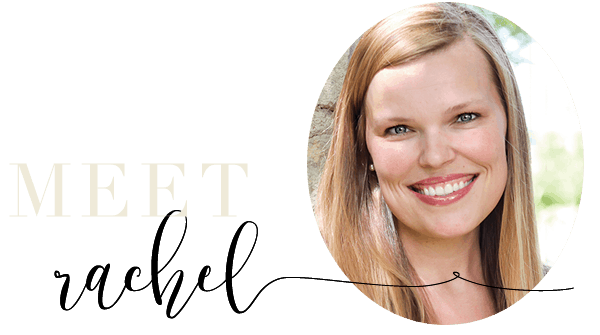 I’m a neutral girl at heart, and I love interest added through texture rather than color. But whatever your natural inclinations, keeping a somewhat monochromatic look can help offset the enormity of a huge sectional. 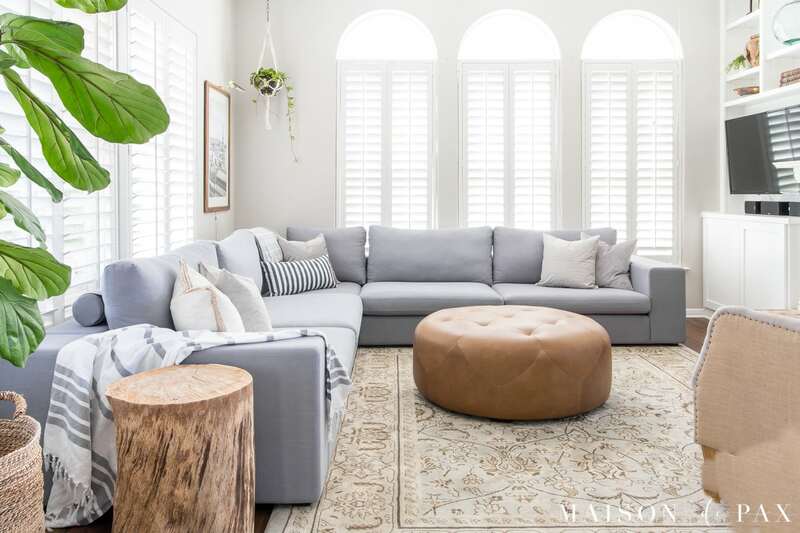 The similar tones can be soothing, allowing the giant sofa to blend in a little, while the textures still provide plenty of variety. I brought in texture with our stump side table (which makes a great DIY if you can find a log!) and the neutral rug. Of course the natural fiber rug near our back door adds to those layers, as well. The linen look of the sofa, the leather of the ottoman, and the burlap back to the armchair also contribute to the rich textures in the space. 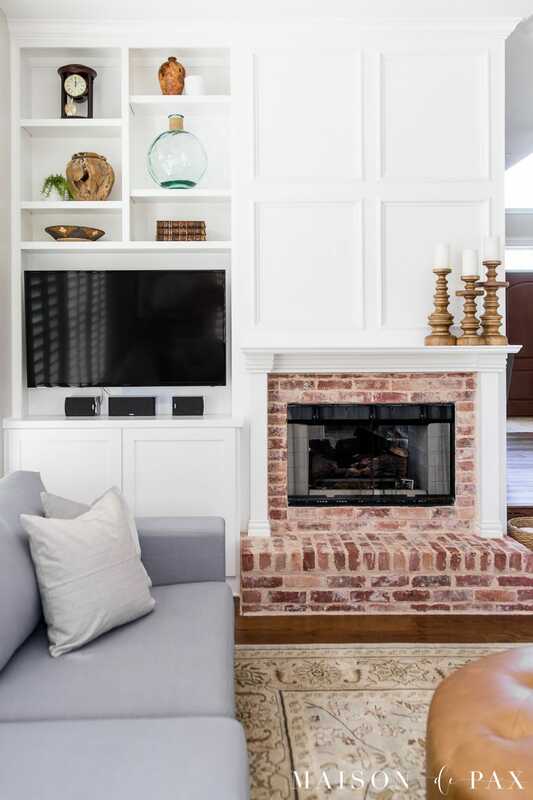 Not to mention the antique brick of the fireplace balanced with the crisp white molding (get all the info on our fireplace project here). 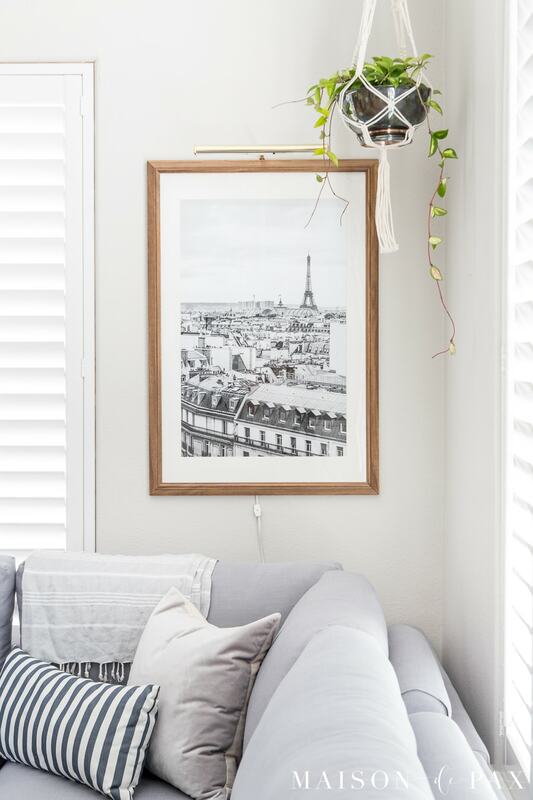 Whether large or small, using only 1-2 pieces of wall art will help the space feel less cluttered and more open. I topped it off with an inexpensive picture light which I ordered from Amazon because we need a light in that corner and don’t have space for a lamp behind the sofa. To be honest, it’s a little lightweight and the brass is yellower than I would like, but for $25 it’s a great place holder and functional light for that corner until I find the perfect thing. 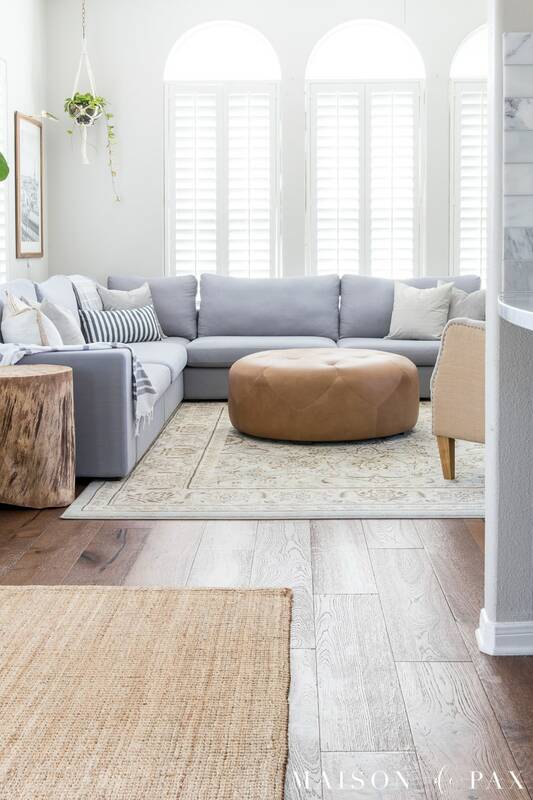 Accents are the icing on the cake to your living room, but too many can make the space feel cluttered. Keep it light and simple! The more kids I have, the less stuff I want. Tell me I’m not alone?! You’ll notice that the coffee and side tables are empty (hello, 10 month old baby), and the hearth is naked, as well. I did add my favorite candlesticks to the mantel (they’ve pretty much earned a permanent place there) and some of my favorite accessories to the cubbies above the tv. 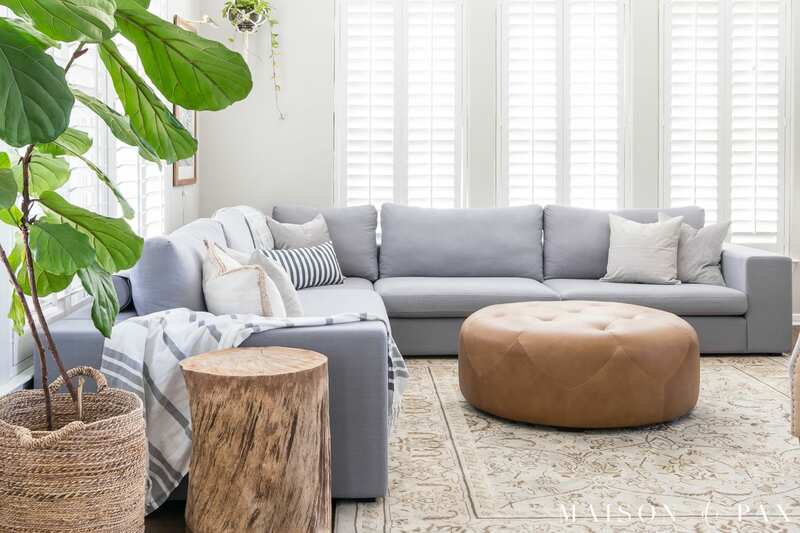 But as you can see, I tried to leave as much white space as possible, and I kept the accents to three general categories: natural brown tones, white, and a touch of blue/green glass to echo the blue gray sofa and the greenery in the room. And in case you’re wondering, this is a family room, and we do keep a few toys down here: games in the cabinet by the fireplace and baby toys in the basket on the floor. When I’m tired of looking at them, they’re easy to toss back in the basket and cover with an extra turkish towel. And that’s it: my 5 tips for creating a light, bright living room. 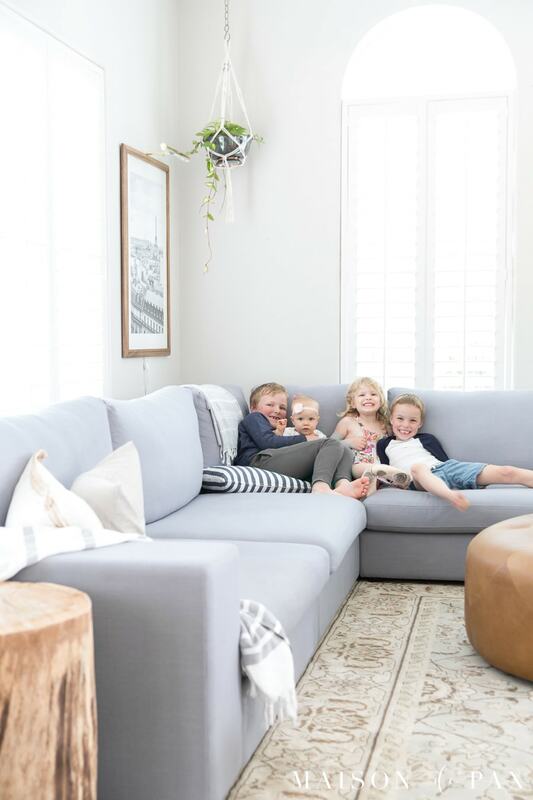 It’s difficult to decorate around a huge piece of furniture like our giant sectional, but I think these techniques help the sectional to blend into the living room and keep the space feeling light and bright. 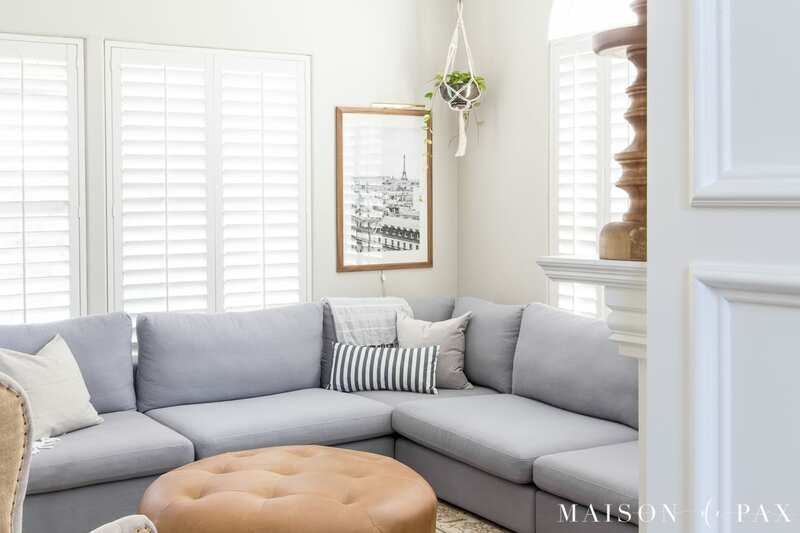 These same tips would help any living room feel the same way, whether you have a sectional or not! Did you find it helpful? Pin it for later! Your room is so pretty! I am especially drawn to your rug, as I am looking for something similar. Can you tell me the specific name of it? (the link takes you to Overstock, but not the exact rug). Thank you so much!! !